Dylan Pelton, a teenage victim of Bonteheuwel’s gang violence, would have turned 20 on 5 November. The post “Mommy mommy, they just shot Dylan!” appeared first on The South African. “I look smart, hey?” Dylan Pelton asked his mother, wearing a black suit, black shirt, red bow tie and a red rose pinned to his left lapel. It was a warm evening on 1 December 2016. The school holidays were approaching and Dylan, 18, was going to a matric ball. The grade 11 student had been invited by his friend Rihanna, whose partner had let her down two weeks earlier. In the photograph his mother, Rozita Pelton, has of him Dylan looks relaxed and confident. His date, on his right, their arms locked, wears a red embroidered dress with transparent sleeves. Her silver handbag matches her delicate silver tiara. Both of them wear matching silver earrings. Dylan is beaming. This is one of the last photographs taken of Dylan. The next day, he was murdered. Left: Dylan with his older brothers Patrick and Matthew when he was two. Middle: Dylan was a talented soccer player at five-years old. Right: Dylan attended his matric ball with his date Rihanna. He would be murdered the next day. The photograph is Dylan’s mother’s favourite. “He looks like an actor here!” says Rozita, laughing. She says that when he was born in Gatesville Hospital on 5 November 1998, Dylan was a small, fat baby with soft and feminine features, like his brothers Patrick and Matthew. “Their faces looked like girls’ faces,” says Rozita. Growing up, he was something of a troublemaker in school. “He was a playful child. He liked to disturb the other children,” says his mother. The Bonteheuwel community adored Dylan. A soccer enthusiast, he motivated children through the sport. For school, his mother packed extra sandwiches to share with less fortunate children. “Dylan liked to put a smile on everybody’s face,” says Rozita. As for food, Dylan’s favourites included akhni, macaroni and cheese, and peanut butter sandwiches. “But only the smooth type,” says Rozita. Dylan came home around 3:30 am from the matric after-party, smiling, wobbling and very tipsy. His mother helped him into bed and left a bucket nearby. At about midday the next day he woke up with a giant hangover. “A heavy, heavy, heavy one,” says his mother. He couldn’t eat anything so she made him a cup of strong black coffee. Tashlin, a childhood friend, came to fetch him at about 14:00. Dylan left home wearing grey track pants, Nike sandals and a black T-shirt with a white patch on it. It was the last time his mother saw him alive. 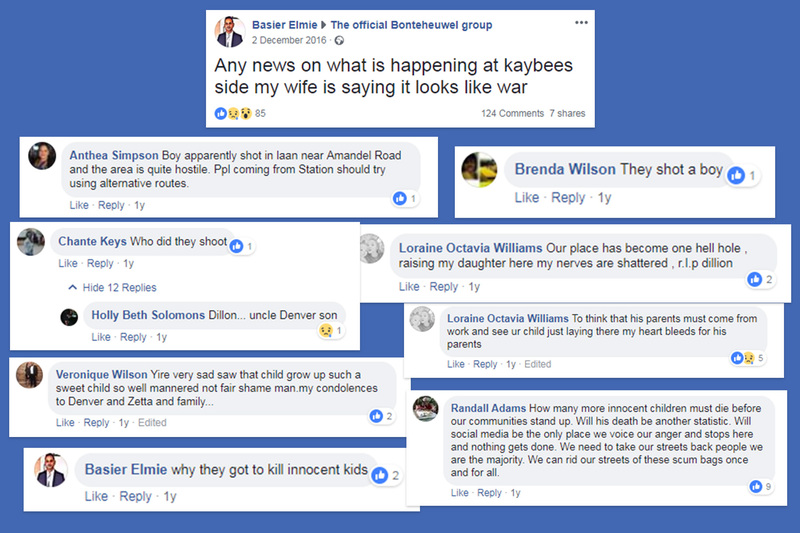 Messages from Bonteheuwel Facebook page on the day of Dylan’s murder. Rozita ran towards the crime scene. A crowd had already gathered. She forced her way through. On seeing her son’s body, she threw up. In broad daylight, in front of a host of witnesses, three people had fired at Dylan on his way back from Tashlin’s home. Three bullets missed him. The others hit him in his right cheek, chest and back. He died minutes later. Tashlin, unhurt, was a witness to the murder of her friend. “The day he was shot, the whole Bonteheuwel was quiet,” says Denver. Both Rozita and her husband, Denver, had known that their son was being targeted. Rozita says Dylan was being constantly harassed by gang members of the Fancy Boys. The assumption was that he was a gangster himself. But he wasn’t. Gang members can usually be identified by their tattoos. But Dylan had only one: his mother’s name – Rozita, written on his left arm in plain black ink. The tattoo was a surprise for his mother’s birthday. Like many areas on the Cape Flats, Bonteheuwel is split into gang territories. Dylan’s home is in Bad Boys territory. Tashlin’s, about one kilometre away, is in Fancy Boys territory. But Dylan belonged to no gang and liked to walk around wherever he wanted to. Concerned for his safety, his parents visited the home of a Fancy Boys leader. “He told us not to worry, but Dylan must stay in the house,” said Denver. But Dylan wasn’t that type of person. He wouldn’t stand for being imprisoned in his own home. Bonteheuwel is a dense coloured township on the Cape Flats. According to the 2011 Census, more than 45,000 live in an area of 3.55 km². By comparison, in Rondebosch, a middle class, mostly white, suburb, about 15,000 people live in a 6.42 km² area. 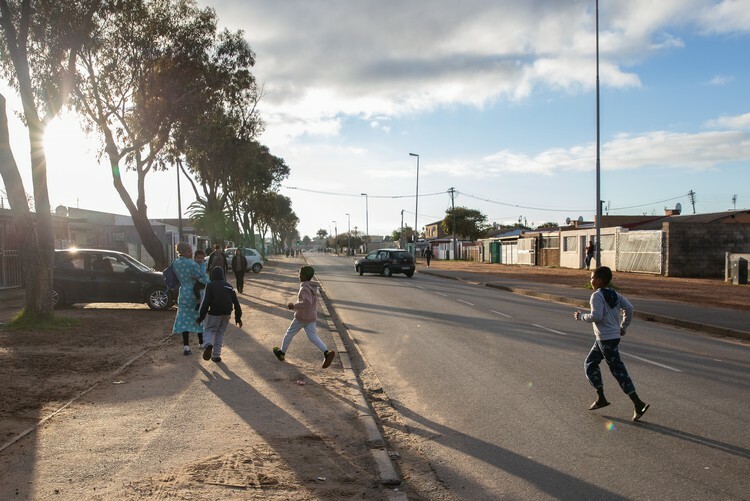 Like other areas on the Cape Flats, Bonteheuwel’s residents are plagued by gang violence. 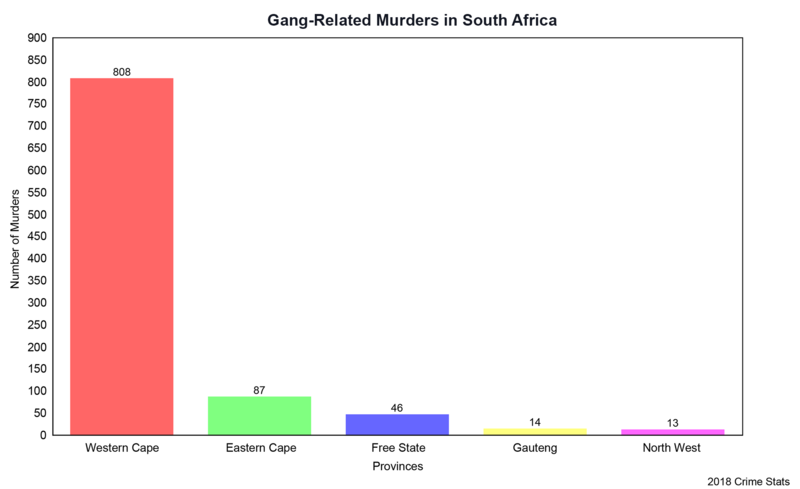 Gang-related murders are almost ten times higher in the Western Cape than anywhere else in South Africa, according to 2018 crime statistics. Graph showing gang-related murders across five provinces. Compiled by GroundUp from page 16 of this SAPS report. But communities are becoming fed up with being prisoners in their own homes. 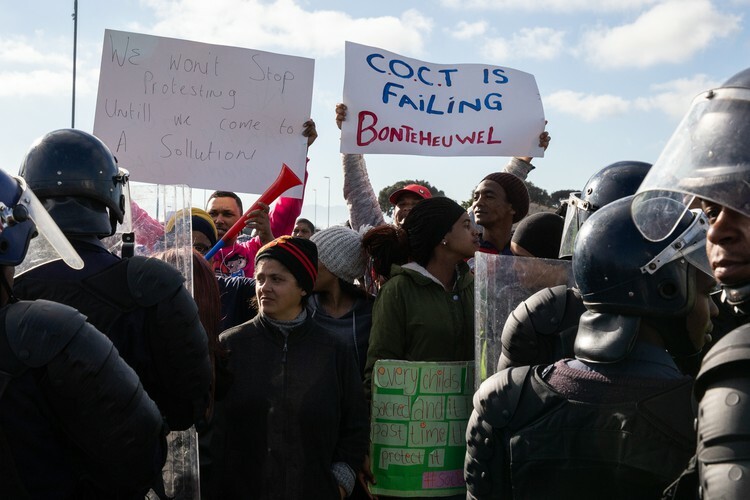 In August, Bonteheuwel residents “shut down” the area, blocking streets and picketing. This followed earlier protests in Kensington, another Cape Flats area plagued by violence. Similar protests followed in Hanover Park, Bishop Lavis and Ottery. Residents from Ocean View, Elsies River, Manenberg and Lavender Hill, all areas troubled by gangsterism, marched to Parliament calling for action against gang violence. Rozita joined the protests in Bonteheuwel. “Where gangsters are concerned, we need to do something about it,” she says. Bonteheuwel has a metro police station (which falls under the municipality), but all crime must be reported to the closest SAPS station (which falls under national government) which in this case is in Bishop Lavis. And over the past five years, the Bishop Lavis police have reported a steady increase in violent crime. The Peltons are currently renovating their home so the walls are rough and plastered with cement. There are pictures of Dylan all over the lounge and kitchen. In the lounge, a memorial is laid out in Dylan’s memory. Dylan’s parents know exactly who the killers are. “The one that shot Dylan, he used to come to this house,” says Rozita. Denver says he sometimes sees the boys who shot his son visiting the liquor store next to their home and the gang leader. He says the murderers went to school with Dylan. “They come here freely. I do nothing, I just look at them. And they look down,” he says. Two years after the murder, no one has been arrested. There was a suspect, according to Captain FC van Wyk of SAPS, but “we were informed that the suspect is deceased,” Van Wyk told GroundUp. Tashlin and her family have moved out of Bonteheuwel and GroundUp was not able to reach her. “They sold their house and had to move because they were threatened,” Denver says. For Dylan’s birthday on 5 November, his parents plan to go back to the place where their son was murdered. They will then make pots of food for the less fortunate. Rozita, who does community work with teen mothers, is launching a feeding scheme in Dylan’s name. “It’s a lifetime scar. My heart is torn into pieces,” she says. Dylan’s death certificate says he died of “unnatural causes”. Published originally on GroundUp. This article is licensed under a Creative Commons Attribution-NoDerivatives 4.0 International License.